An evening of stories with guest storyteller Janis MacKay. The evening is aimed for adults, but older children are also welcome. This should be an excellent night for all ages. 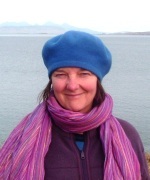 Janis MacKay hails from Edinburgh, but now lives in Caithness, where she is a Writer in Residence. She tells traditional Scottish tales and world stories, including Native American stories and fairy tales. Stories that include the physical or mental transformations of characters into other beings are also a favourite theme. Janis often works with fellow teller David Campbell on workshops and performances.